The Foundation for Internet Domain Registration in the Netherlands (SIDN) has shut down several of its websites and allow temporarily limit access to the domain name registration system due to a security breach of its system. As per the post published on its official site, pieces of malware were identified on Tuesday, July 9, on several websites. To prevent form being more damage, firm immediately took some of the necessary steps for counter measures. The DRS web application was shut down and zone file publication was temporarily suspended. The security break was done after the SQLinjection on the a site "25jaarvan.nl", which leads exploit to the whole server with the help of malicious backdoor. SIDN is not the only registrar whose systems have been breached. 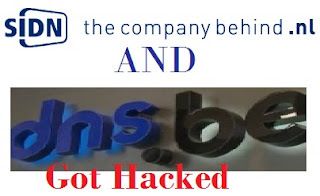 Same hacker have also deface DNS.be, a organization that manages the .be top-level domain. As the post posted on the DNS.be site firm state that user data or the registration platform had not been compromised. The incident is still being investigated.